Cigarette Smoking Overall Among Adults in the U.S. is Down. The cigarette smoking rate among adults in the U.S. dropped from 20.9 percent in 2005 to 17.8 percent in 2013, according to new data published by the Centers for Disease Control and Prevention in today’s Morbidity and Mortality Weekly Report (MMWR). That is the lowest prevalence of adult smoking since the CDC’s National Health Interview Survey (NHIS) began keeping such records in 1965. The report also shows the number of cigarette smokers dropped from 45.1 million in 2005 to 42.1 million in 2013, despite the increasing population in the U.S. 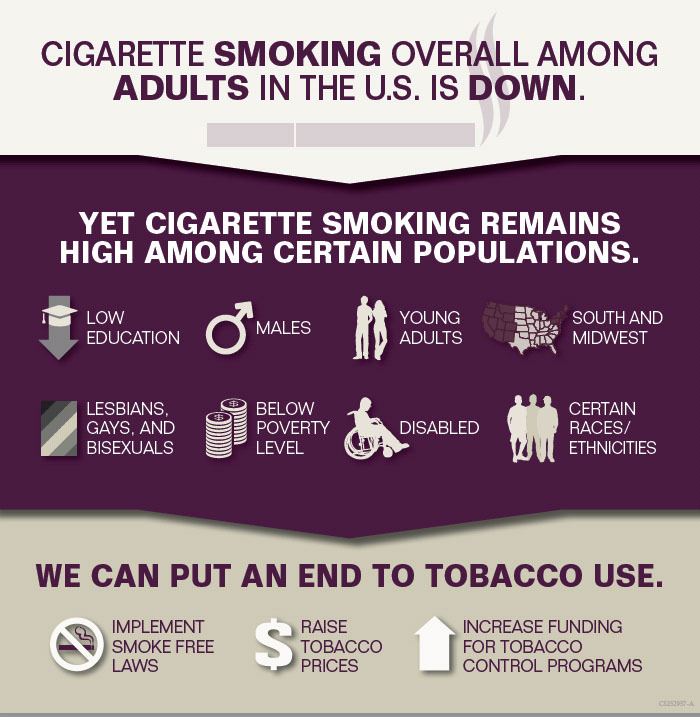 While smoking rates have dropped, there is a significant need to help those who continue to smoke. Cigarette smoking remains especially high among certain groups, most notably those below the poverty level, those who have less education, Americans of multiple race, American Indians/Alaska Natives, males, those who live in the South or Midwest, those who have a disability or limitation, and those who are lesbian/gay/bisexual. Data specific to sexual orientation were collected for the first time by the NHIS in 2013. Among current cigarette smokers, the proportion of those who smoke every day decreased from 80.8 percent in 2005 to 76.9 percent in 2013. The proportion of cigarette smokers who smoke only on some days increased from 19.2 percent in 2005 to 23.1 percent in 2013. Among daily smokers, the average number of cigarettes smoked per day declined from 16.7 in 2005 to 14.2 in 2013. The proportion of daily smokers who smoked 20 to 29 cigarettes per day dropped from 34.9 percent in 2005 to 29.3 percent in 2013, while the proportion who smoked fewer than 10 cigarettes per day rose from 16.4 percent in 2005 to 23.3 percent in 2013. Cigarette smoking is the leading preventable cause of disease and death in the United States, killing more than 480,000 Americans each year. For every person who dies this year, there are over 30 Americans who continue to live with a smoking-related disease. Smoking also takes a devastating toll on our nation’s economy, costing more than $289 billion a year (including at least $133 billion in direct medical care for adults and more than $156 billion in lost productivity). In addition, use of other forms of smoking tobacco which are also very dangerous, such as cigars and hookahs, are not declining. In some populations, especially among young adults and adolescents, use of these products may even be increasing. Surveys show that about 70 percent of all cigarette smokers want to quit, and research shows quitting completely at any age has health benefits. Smokers can get free help quitting by calling 1-800-QUIT-NOW. There they can get free counseling and information about the seven smoking cessation medications approved by the U.S. Food and Drug Administration. CDC’s Tips From Former Smokers campaign features real people living with the consequences of smoking-related diseases and offers additional quit resources at http://www.cdc.gov/tips, including cessation assistance developed by the National Cancer Institute at the National Institutes of Health.